Conversions of former farm buildings can sometimes fall short of what is required for modern living – but not here! This is a delightful home with an immediate welcoming atmosphere. There is plenty of accommodation for most families and perhaps an extended family if mum or dad want to come too. The house radiates from an impressive reception or dining hall with vaulted ceiling, gallery and exposed stonework which also features a multifuel stove. There is a formal Drawing Room, concealed office (or playroom), cosy living room and delightful sunroom which looks into the private mature garden. The kitchen is supported by a good size laundry room and there is a bedroom on the ground floor. Upstairs there are three further double bedrooms, family bathroom, the master bedroom also having an ensuite bathroom. A sunny mature garden offers total privacy and there are views over the surrounding countryside. There is garaging for three cars or for use as workshops and stores with plenty of parking. In summary, this is a beautiful combination of old and new which offers delightful space in a semi rural environment only minutes from Belfast, Holywood, Dundonald, Bangor or Newtownards. Hand painted kitchen with excellent range of units, glazed display cabinet, display shelving, four ring hob and Bosch under oven, one and a half bowl stainless steel sink unit with mixer tap, plumbed for dishwasher, oil fired Rayburn, tiled splashback. Casual dining area. Double doors to sun room. Belfast sink unit, plumbed for washing machine, range of units. Pitch pine flooring, door to patio/garden with delightful views. Tongue and groove ceiling, brick fireplace with sleeper mantel and wood burning stove, original stained glass window, built-in cupboard. Cast iron fireplace, original exposed stone wall. Low flush wc, vanitory unit. Reading area with velux windows. Access into eaves, storage cupboard. Exposed stone wall. Ball and claw foot bath, separate shower cubicle with thermostatic shower unit, low flush wc, pedestal wash hand basin, spotlighting. Luxury white suite comprising freestanding bath with mixer tap, separate fully tiled shower cubicle with thermostatic shower unit, heated towel rail, low flush wc, ceramic tiled floor, fully tiled walls, velux window, low voltage spotlighting, extractor fan. Cast iron fireplace, tongue and groove vaulted ceiling. Velux window. Original wood flooring, tongue and groove ceiling. Additional area for desk. Access to roofspace. Light and power, wood pellet boiler and hopper. Ample driveway parking with turning area. Barked flowerbeds with a wide variety of shrubs providing an array of colour. Vegetable garden. Summerhouse and garden shed. Septic tank. Private patio area in handcut stone - ideal for BBQ's/summer entertaining. ** Renewable Heat Incentive Grant available and the homeowner would benefit by approximately £2,200 per annum. 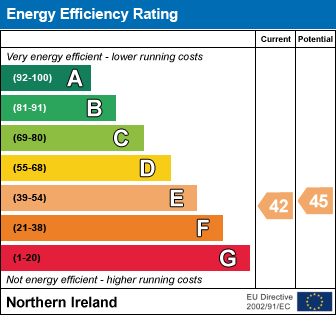 This is a fixed, set, grant (unlike the RHI scheme). Travelling up Church Road, Holywood turn left onto Ballymiscaw Road and No 98 is on the left hand side. Check out the property I found on PropertyPal.com: 'Byre Hill', 98 Ballymiscaw Road, Craigantlet, Dundonald, Belfast BT16 1TX.